Crazing Resistance 0.34- 0.37 Mpa 10 Hrs. Min. 20 Hrs. Min. 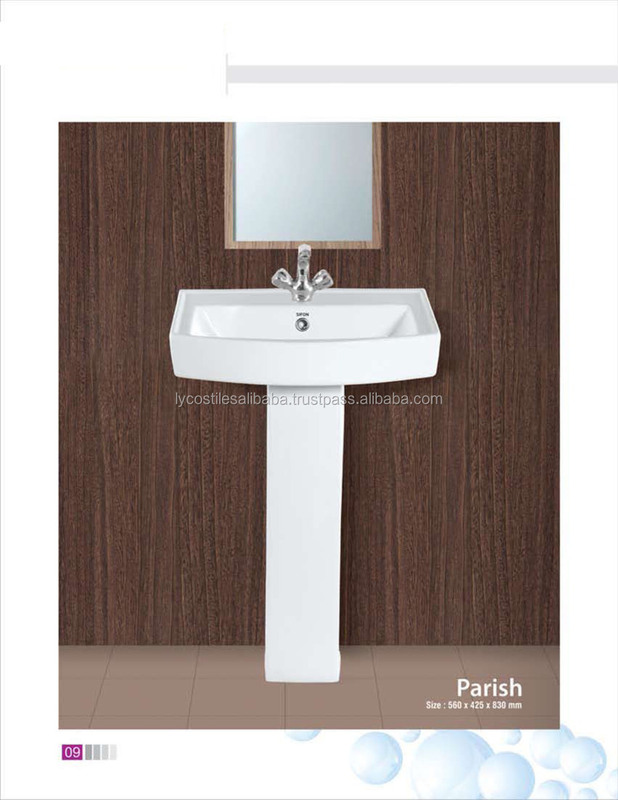 Install Wash Basins with or without pedestals on CI Bracket with Rag Bolts. 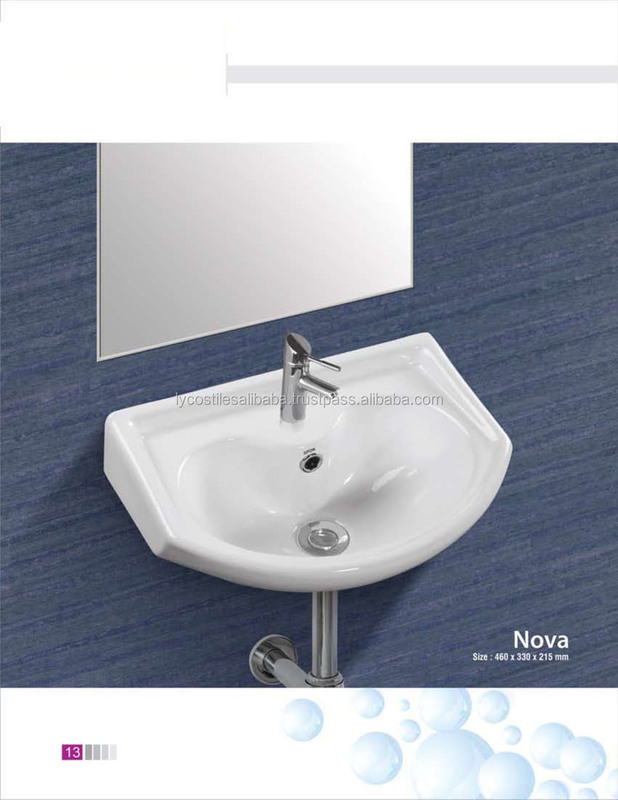 If wash basin is Large in size install on pedestal screwed to the floor. Install wall mounting E.W.C. With the help of CI chair. Install Floor Mounting E.W.C. Screwed to the floor. Avoid using Cement at the hollow bottom portion of E.W.C. Regular Cleaning with dry cloth / Mild Detergent is recommended to avoid stains & if required diluted Hydrochloric acid may be Used. Do not use hard bristled brush for cleaning so as to avoid scratches. 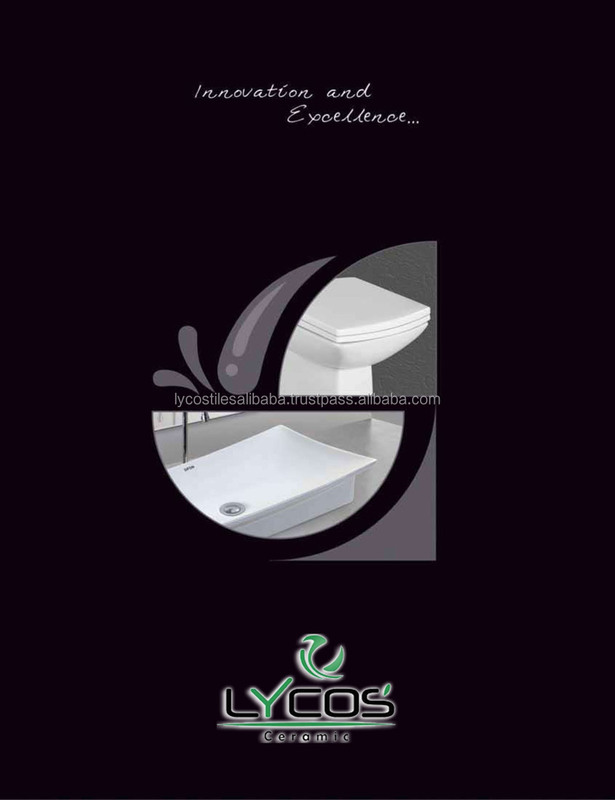 At Ceramics Division, LYCOS Ceramics, it has been our endeavour not only to provide you with the best possible service, but also to help you serve your customers better. We have been analysing the complaints received by us and have discovered that most of the complaints fall into a pattern. We would like to share the qualitative results of the analysis with you, so that you can be better prepared to handle any complaints received from your customers. 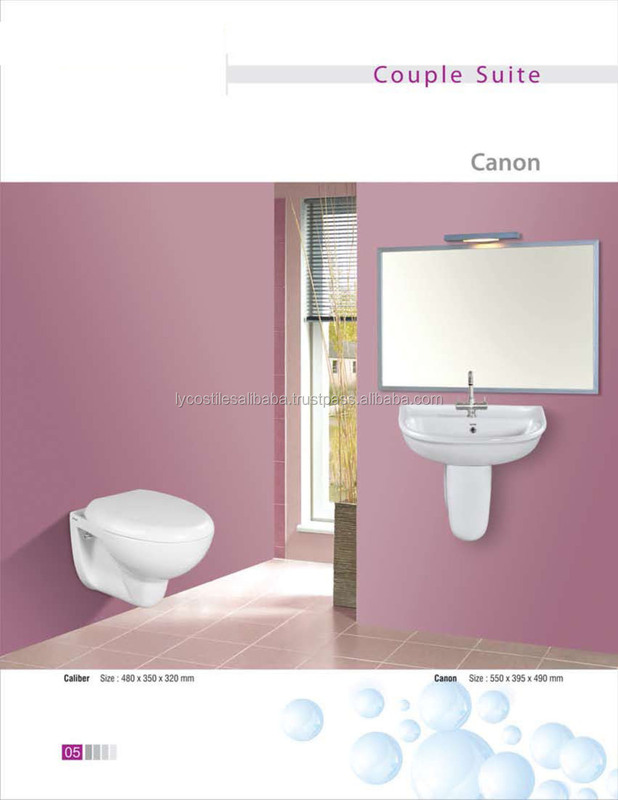 The water closet shall be filled with water to its normal water seal level and charged with six pieces of usual toilet paper or polythene sheet of 0.05 mm thickness approximately 150 mm x 115 mm in size and loosely crumpled. It shall then be flushed. This test shall be repeated four times and the pan shall discharge the full charge of the paper at last three out of four times. The whole of the interior surface of water closet to 40 mm below the flushing rim shall be smudged with quartz powder of contrasting colour passing through 1.18 mm IS sieve and shall then be flushed observing carefully the surface of the water closet during the flushing. Immediately after the flushing, there shall be no smudge left on the bowl. 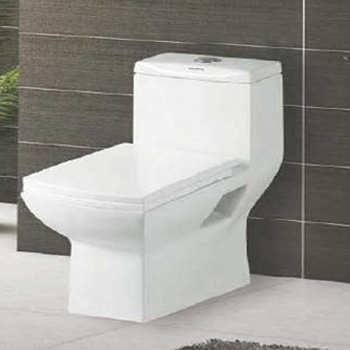 The water closet when sealed at the outlet and vent (if fitted) with water-tight seal shall be capable of holding not less than 10 1 of water between the normal water level and the highest possible water level of the water closet as installed. Single Ball Test :The ball shall be made of non-absorbent material. The relative density of the ball shall be between 1.075 and 1.080. The diameter of the ball shall be 43 ± 0.5 mm. Place the ball into the water closet to be tested and then flush the water closet. The ball shall be discharged in the normal manner. The outlet (trap) of the water closet goes into the floor. The outlet (trap) of the water closet goes into the wall. percent of all balls should be flushed out in the five tests. section of 100 mm x 100 mm positioned across the centre of the opening of the top surface of the WC. There shall be no damage or defect which shall occur to the WC. Specification of the Saw Dust 20 g of dry saw dust test sifted through 2 mm sieve. flush the WC. The sprinkle saw dust should be cleaned below 40 mm of rim of WC. to 10 Nos., shall not be the cause for rejection. towards the back of the closet. Fix the expansion plug provided. be tightened any further with one hand. facing the front of the cistern. valve ring sits securely around the groove. could be worn out. Replace the valve ring. with the hole provided in the lid of the cistern. provided in the bottom of the valve seat. be tightened further with one hand. stop dog touches the bottom of the lifting bar. (when observed in assembled condition). inlet in the clockwise direction to open the inlet. mark provided on the floating body). provided in it face each other after installation. Continuous innovation and improvement in manufacturing techniques and products are carried out regularly. We reserve the right to supply articles which may not correspond exactly with the particulars given in this booklet. Quick and Efficient reply within 24 hours After receiving contact. Sample order will be available. 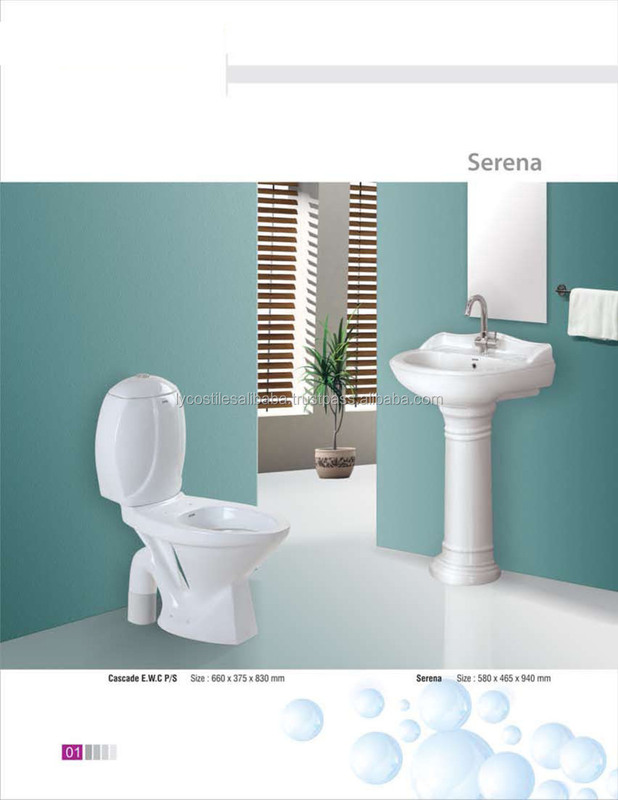 Over 10 Years experience in manufacturing one piece toilet, two piece toilet, pedestal basin, urinal, counter basin, wall-hung basin,bidet and bathroom accessories and so on. Likewide range of Digital Inkjet Wall and Floor Tiles, Rotocolor Wall &Floor Tiles, Polished Porcelain Tiles, Glazed Porcelain Tiles, Ceramic Wall & Floor Tiles, Designer Tiles, Exterior Tiles and all kind of sanitary wares.